As the price for his being allowed onto the Temple Mount, Professor Yoel Elitzur had to sign a 'no-praying' promise for police. It sounds like the punchline to an old Jewish joke, but Professor Yoel Elitzur wasn't laughing when police made him sign a document in which he promised “not to commit any overt religious act or ritual,” as the price for his being allowed onto the Temple Mount. The police demand was all the more absurd, Temple Mount activists said, in light of a court decision last week that said that Jews could pray on the Temple Mount without restrictions. Far from the usual portrayal of Jews attempting to ascend to the Temple Mount as “hilltop youth” and the like, Elitzur is a respected member of the Israeli academic community. The head of Land of Israel studies at Herzog College, he also lectures at the Hebrew University and the Michlalah college in Jerusalem, and is the son of Bar-Ilan founder Yehudah Elitzur. None of that protected Elitzur from being treated by what students and acquaintances said was a “very insulting manner” by Israel Police. In the document he was required to sign, Elitzur promises not to bring any religious items, documents, books, flags, leaflets, signs, or anything else that could be construed as “provocative” when he enters the Temple Mount area. Police cited an incident from last month as justification for the requirements. In that incident, Elitzur was arrested for shouting out “Hashem Hu Ha-Elokim [Hashem - He is God]” after being harassed and confronted by a Muslim who yelled out at him “Allahu Akbar” [God is Great] in Arabic. Jews have been subjected to increased harassment by Arabs on the Temple Mount in recent months. Investigators from the Shin Bet and elite police unit Lahav 433 recently exposed two organizations - "Al-Fajr" in Nazareth and "Muslim Women for Al-Aqsa" in Jerusalem - who finance the harassment by Muslim activists on the Temple Mount. The activists come daily to the Temple Mount and stand in the area designated for visitors and tourists. When groups of Jewish visitors arrive to the Temple Mount, they use physical and verbal violence against the visitors "in a manner that violates freedom of religion as well as violates the personal safety of visitors to the site," police said. Nevertheless, it was Elitzur who on Sunday was required to give up his right to free religious worship in order to visit the Temple Mount. If, police warned him, he refused to sign, or violated his commitment in any way, they would ensure that he would not be allowed to enter the Temple Mount, with the length of “exile” from the site to be left to their discretion. Last week, Magistrates' Court Judge Malka Aviv ruled that police “must make sure that Jews are able to pray on the Temple Mount and not to act sweepingly to prevent Jews from praying there.” The court made the ruling in the case of an attempt by police to bar Temple Mount activist Yehuda Glick from leading groups and praying on the Mount. Glick sued, and police lost - and he was NIS 500,000 in damages and NIS 150,000 in legal costs. 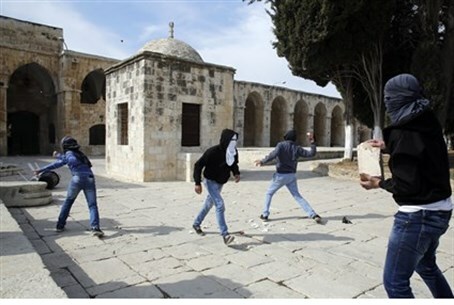 Commenting on the story, Temple Mount Institute Director Rabbi Chaim Richman said that the requirement by police was "just the latest in a series of infractions that have occurred in just the past week, despite the court having ruled that these documents are illegal. I went to the Temple Mount last week, and the police said 'that decision doesn't exist as far as we are concerned.' The judge very harshly spoke out against these documents, but it seems as if police are above the law. They are continuing with the tactics they had been using before and instituting the same fictitious rules. It seems to me as if something else is going on. It appears that the police are taking their orders from a much higher source. The only real element that deals with these issues is the Prime Minister's office, and they are apparently setting the tone."